The global luxury folding carton market has been recently analyzed by Transparency Market Research to evaluate the global and regional trends and market forecast. As per the report named, “Luxury Folding Carton Market: Global Industry Analysis 2013 – 2018 and Opportunity Assessment 2019 – 2027,” TMR observed that the consumer preference for packaging and growing focus of the end-user industry on differentiating their products from a competitor’s are boosting the demand for luxury folding cartons. 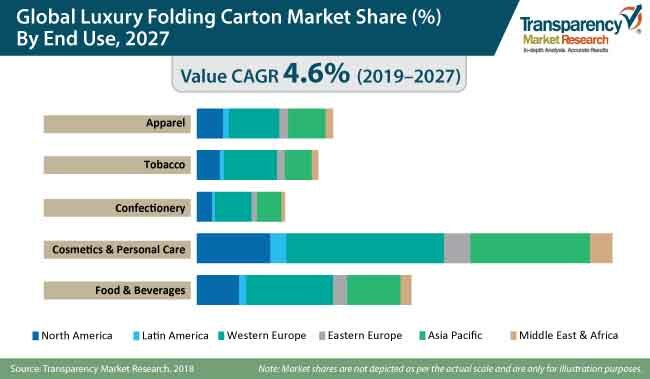 In 2018, the global luxury folding carton market was valued at around US$ 2 Bn and is anticipated to expand at a CAGR of 4.6% during the forecast period (2019-2027). The personal care and cosmetics industry is anticipated to be the most dominating end user for luxury folding carton owing to the need for aesthetic and specialized packaging. Luxury cosmetics are generally packaged in primary and secondary packaging, where a paperboard luxury folding carton is used as the secondary packaging. Printing technologies play a key role in converting a standard folding carton into a luxury folding carton. Weight, shape, structure, and material of luxury folding cartons are influencing the personal care and cosmetics industry preferences for packaging. In 2017, the global luxury cosmetics market was valued for about 23% of the total beauty market and is projected to witness impressive growth during the forecast period. Skincare and makeup products are expected to be prominent segments in the global luxury beauty market. Apparel marketers are focusing on growing their retail sales with the help of exclusive packaging and excellent shelf appeal. With luxury folding carton, end users are focusing on shelf appeal and customer engagement at point of sale and providing delightful service to retain their customers. E-commerce industry emphasizes on creating uniqueness for consumers through interesting packaging of apparel. Luxury folding cartons for the apparel industry are projected to witness fast-paced growth during the forecast period amongst all end users. Western European apparels industry is estimated to be the largest consumer for luxury folding carton, followed by North America and the Asia Pacific regions. The introduction of new apparel brands in emerging markets such as the Asia Pacific and Latin America is anticipated to boost the demand for luxury folding cartons during the forecast period. The food and beverages industry has transformed a lot in the past few years. The increased competition and a new era of online food services are repositioning the food and beverages packaging market. Alcoholic beverages are expected to a prominent user for the luxury folding carton owing to the need for premium packaging formats for high-cost liquors. Online food services are focusing on luxury folding carton to enhance brand visibility and use smart packaging for digital connectivity, which is expected to create technological advancements in luxury folding carton. The global luxury folding carton market is analyzed by observing the global and regional key players of the luxury folding carton market. The dedicated section for competitive landscape is presented to explain the company overview, total and segmental revenue, how it competes in the luxury folding carton market, and product lines. The key players operating in the global luxury folding carton market which are profiled in the report are- Robinson Plc, McLaren Packaging, Sunrise Packaging, Stora Enso Oyj, Westrock Company, International Paper Company, Smurfit Kappa Group Plc, DS Smith Plc, Mondi Group, Coveris Holdings S.A., Karl Knauer KG, Keskeny & Co. Ltd., Mayr-Melnhof Karton AG, Groupe VERPACK, Metsä Board Oyj, KOLBUS GmbH & Co. KG, HH Deluxe Packaging, Solutia Italia Srl, Stevenage Packaging Limited, and Diamond Packaging Corp. The competitive dashboard in the luxury folding carton report distinguishes key players on the basis of different parameters such as regions, employees, key strength, product lines, and others. In September 2018, the United States-based company Hippo Premium Packaging introduced a new child-resistant packaging line for the cannabis industry. Duallok, the luxury folding carton, is expected to offer greater brand visibility to the cannabis industry.